Temple Grandin speaks during her lecture at Welsh-Ryan Arena Wednesday night. Grandin highlighted the importance of encouraging different thinking styles, particularly with autistic children. 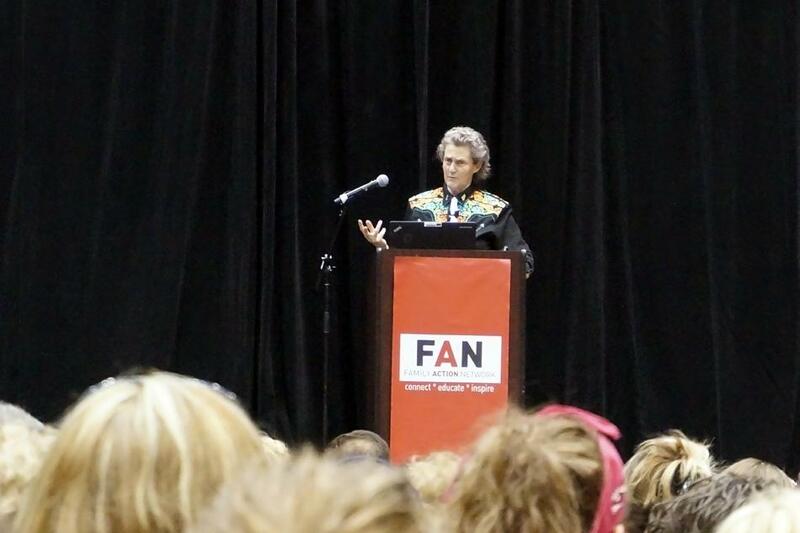 Animal scientist and author Temple Grandin spoke to hundreds of people at Welsh-Ryan Arena on Wednesday about the necessity of “different kinds of minds” in society, specifically relating to autism. Grandin, who was diagnosed with autism as a child, said neurodiversity is essential because individuals interpret and solve problems differently. This is why the proper education of children on the autism spectrum is imperative, she said. “What I want you to think about today is how different minds may process information differently,” Grandin said. Because autistic children may have different learning styles, including spatial visual, auditory thinking or photo realistic, she said it is important to accommodate for this and help them develop their natural talents. The event was hosted by the Family Action Network, an organization that hosts speakers who discuss healthy youth development throughout the academic year. Northwestern’s Communication Sciences and Disorders department co-sponsored the event with the School of Education and Social Policy’s Master of Science in Education program. Grandin, who holds a PhD in animal science, works as a professor at Colorado State University and also consults slaughterhouses on improving the quality of life for their cattle. She credits her insight into humane animal treatment to her autism, saying it allows her to “think in pictures” and see things others might miss. “Visual thinking has been a huge asset in my career designing livestock facilities,” she said. Communication lecturer Stacy Kaplan said that due to the increasing number of people being diagnosed with autism, it was important for the NU community to hear Grandin’s speech. Sarah Liddell, an attendee with an autistic five-year-old son, went to the event to gain more insight from Grandin after having read several of her books. “I think the most helpful thing was, even though (autistic children) may get obsessed with something … you want to take that and expand it,” she said. Another mother in attendance, Kelly Oberholtzer,who also has an austistic son, said the event allowed her to learn more about her son’s point of view. She agreed with Grandin’s call to encourage specific, individual skills. Eustacia Cutler, Grandin’s mother, opened the event by giving her perspective on raising an autistic child. She later joined Grandin and Communication Prof. Molly Losh, who specializes in autism and other neurogenetic disorders, for a panel discussion. Earlier this month, NU released a study that found simulating human interaction can help people with autism improve the social skills needed when interviewing for a job. This is another step in the direction Grandin wants to see.